Back when horses were the main mode of transportation, stagecoach trails became the first formal infrastructure for Illinois travel. Join retired college professor Mark Schwendau and his wife, Karen, as they travel the Galena-Chicago stagecoach trail by motorcycle and note interesting landmarks in each community along the way. 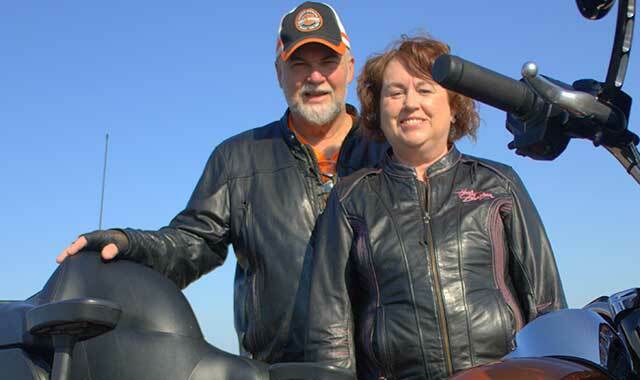 Mark and Karen Schwendau of Byron, Ill., enjoy exploring the Old Northwest Territory by Harley. Before railroads appeared here in about 1854, the Galena-Chicago Trail was the main east-west thoroughfare between Galena, Ill. and Chicago. Propelled by lead mining and steamboat access to the Mississippi River, Galena was much more prominent than Chicago, incorporating in 1826 with a population approaching 10,000; seven years later, Chicago incorporated with a population of just 4,000. Galena’s growth spurt ended abruptly when miners began chasing California gold in 1848. Today, the further west you travel the historic Galena-Chicago Trail, the easier it is to imagine it hasn’t changed much in the nearly 200 years since stagecoaches navigated this route. This is particularly true when leaving Warren, Ill., on Stagecoach Trail Road, which winds along a high ridge with panoramic views looking both north and south. Stagecoach trails ran through land that was high and dry, with as few water crossings as possible, since those required a ferry. Bridges were not yet constructed. Sometime around 1839, John Frink and Martin Walker teamed up to establish a stagecoach route from Galena to Chicago. By 1840, they formed the Frink & Walker Stagecoach Company with a Chicago hub located on the southwest corner of Dearborn and Lake streets, an address now occupied by the Goodman Theater. The men became giants in the stage travel industry and dominated the market for nearly 15 years. Most of the coaches in Frink & Walker’s large fleet were nine-passenger, four-horse “post coaches” manufactured by Abbot and Downing of Concord, N.H., commonly known as Concord coaches. Some had a hitch team of six when the trail was known to be muddy. A one-way trip to Galena cost about $12 dollars at a time when the average yearly wage was between $200 and $400. There’s some confusion about the exact year the Galena-Chicago Trail was established. Frink’s coaches were said to be making the trip before Frink partnered with Walker in 1839, shortly after the last natives of the area were driven from Illinois during the 1832 Black Hawk War. There’s some evidence that the Galena-Chicago Trail was established, informally, prior to 1836. As Frink & Walker increased its runs between Chicago and Galena, the company put competing stagecoach lines out of business, such as J.D. Winters Freeport to Chicago. Fare wars and aggressive management played a role, as drivers were encouraged to beat the competition to destinations. Legend holds that John Frink once yelled at one of his drivers, “I find horses. I want you to find whips!” The driver had just lost a destination race to a rival coach line because he didn’t want to kill his horses by whipping them to exhaustion. A skilled coachman was accompanied by a postilion, also called post boy, who rode the front left horse in a team. Frink & Walker preferred to use post boys rather than additional coachmen so they could fit one more passenger into the coach. The post boy blew a horn when the stage departed and played a fanfare upon arrival to destinations. This notified town folk that the stage was in with the mail, small parcels, newspapers and passengers. Folks on this coach trail sometimes had brushes with Native Americans as well as undesirables on isolated stretches of the trail. However, most struggles were with the deep mud of the trail. Stagecoaches traveled during daylight hours for safety. Every so often they would stop to switch out horse teams and to rest passengers. A typical stagecoach inn meal included chicken or pork, bread and butter, and fruits and vegetables in season. This might be chased down with coffee, cider, some form of alcohol, fresh milk or water. Sleeping accommodations were sometimes in one large room; people slept in their day clothes. Overnight lodging ran about 50 cents per night. Privacy was a luxury during the stagecoach era. At times, travelers who began a trip as strangers wound up sleeping together in the same bed (men-with-men and women-with-women). Breakfast was often American bacon and eggs with corn bread or toast and coffee. Iceboxes were yet to come, so fresh milk was a treat. The dirt trail often developed deep ruts from wagon wheels in mud, after rain or snow melt, making travel slow. Stagecoaches traveled at an average speed of about 5 miles per hour, with a total daily mileage of about 30 miles per day in good weather and trail conditions. The Galena-Chicago trip averaged five days to travel the 165-mile trail. While this was never an official motto, coachmen followed it. Postmaster General John McLean took office in 1823 and installed a number of innovations by 1830. He made the U.S. Post Office the world’s most effective mail delivery system with a “hub and spoke system.” McLean hired private stagecoach lines to carry the mail, instead of using government-owned equipment and employees. The Frink & Walker Stagecoach lines monopolized the industry, which included mail delivery in all the upper Midwest U.S during the 1840s. It cost 7 cents to mail a letter up to 40 miles; a sliding distance scale was used to figure postage charges. From Chicago, the Galena-Chicago Trail is found by taking Higgins Road, which becomes Ill. Route 72 and ends at Ill. Route 73. From there, take Route 73 north to Lena, Ill., where West Lena Road leaves town and becomes North Stage Coach Trail Road. Upon entering Warren, Ill., the road becomes East Stage Coach Trail Road. At about Scales Mound, Ill., it becomes West Stage Coach Trail Road. Many interesting communities are found along the Galena-Chicago Trail. Elgin was well known to the Potawatomie because the Fox River could be forded at places many times of the year. Hezakiah Gifford gave Elgin its name after the 1833 Black Hawk War. By 1837, it had a bridge and several grain mills. Elgin was the first stop after a day of travel from Chicago, about 35 miles out. Thanks to Gail Borden, Elgin became known as the Butter Capital of the World for production and sale of dairy goods to the Chicagoland market. Dairy became less important to Elgin after the opening of the Elgin Watch Co. in the late 19th century. From Elgin, stagecoaches ran either northwest to Marengo or due west to Genoa. Genoa’s Main Street is part of the Galena-Chicago Trail. One of its first buildings was a stagecoach stop known as the Pacific House Hotel and it still stands at 501 W. Main St. Thomas Madison, a Revolutionary War soldier from Ashtabula County, Ohio, developed the town and named it after a town in New York. Madison built his original log cabin on what is now the northwest corner of Main and Washington streets. The city that’s now Byron, Ill., was founded as “Bloomingville,” but that name was rejected by the Post Master General as too similar to other towns already in Illinois. The name was changed to honor Lord Byron, an English poet. Byron was founded after settler Jared Sanford rode through the area on his way from Galena to Midway (Rockford). There are two recorded Rock River ferry crossings in Byron and a railroad now runs over the first one. The second consisted of a 3-inch diameter rope ferry. The ferry landing is still visible on the north side of the Rock River, at the south end of Market Street. To this day, the river has shallow spots where stagecoaches could have driven through when the water was low. Other traces of the stagecoach era are “stagecoach steps” that exist in several places throughout the city. These roadside steps allowed women, in their petticoats, to more easily enter and exit the coach. Byron was likely an official stop, since Lena was the next known stop and was 40 miles away. Lena was founded by Samuel Dodds of Indiana, after he built a log cabin along the Chicago-Galena Trail. Folklore holds that, during his westward travels, Dodds passed through a small community where he was offered 160 acres of land in exchange for his horses. He turned down the offer and continued on. Today those160 acres are known as the Chicago Loop. Dodds set up what may have been northern Illinois’ first bed & breakfast when he began offering food and lodging to stagecoach travelers in Lena. His business grew as Galena and its lead mining industry grew. The flow of travelers, mail and other goods moving along the stagecoach trail grew each year and Dodds’ inn became an important stop. In 1848, he replaced his log cabin with a stately limestone building that would become the community’s first general store and post office. This historic old stagecoach inn still exists as a private residence at 210 E. Lena St.
From Lena, stagecoaches headed off to Nora, Ill., some 13 miles away. The horses began an uphill climb, slowing their pace. Nora was founded by Garrett Garner, who sold it to New Yorker Asher Mine. In Nora, the trail passes Tiger Whip Road (2nd Street), where the Outer Limits Saloon once stood as a stagecoach stop. Farm fields have since taken over this plot, but a concrete sidewalk remains. At the time the stagecoach ran, Nora had a dry goods store, tobacco sheds, grain elevator, barber shop, hardware store, meat market, post office, blacksmith, wagon shop and more. Even as late as the 1870s, Nora was home to more than 1,000 people. But the town fell on hard times after fires repeatedly destroyed the frame-built Main Street business district. Despite its small size, Nora has a reputation among locals for being the final drinking destination after all other bars in the area close for the day. From Nora, the destination could have been either Warren (north branch of the trail) or Millville (south branch of the trail), where the stagecoach would put in for the night one day out from Galena, about 11 miles away. From here, the horses would continue a slow ascent toward the highest point of Illinois, near Scales Mound, through some captivating hills. The town of Warren, midway between Lena and Galena, was founded by Alexander Burnett and named after his son. It began to flourish after a limestone hotel was built in 1851 to serve as a stopover for Frink & Walker stagecoaches. Today the hotel is listed on the National Register of Historic Places and is known as the Warren Community Building. Warren may be best known today for hosting the oldest county fair (Jo Daviess) in Illinois, dating back to 1860. The fairgrounds are at the intersection of the Stagecoach Trail Road and the Illinois Central Railroad. An important stop along the trail was Apple River, founded in 1832 by Daniel Robbins. At one time, it thrived with wagon, plow and broom factories. It was also known as a hub for shipping poultry and livestock. Today, like Nora and so many other Illinois towns, it’s a shadow of its former self. A gentleman named R.J. Spillane still operates his own stagecoach line from Apple River, where tourists can book a short stagecoach ride. Contact R.J. at Stagecoach Trails Livery to get a taste of what it was like to travel from Chicago to Galena in the early 1800s. Trips are usually scheduled on weekends. Millville, Ill., is a village you will no longer find on any map. It was established in 1835 in the Apple River Canyon. John R. Smith was responsible for erecting the village’s first buildings and sawmill. It became an important rural service stop along the stagecoach trail, since Millville also had a blacksmith. The town was platted by Smith on April 14, 1846, within Rush Township, and that map still exists. In 1853–54, the Illinois Central Railroad bypassed Millville, relegating it to backwater town status. Despite this, the grist mill and a blacksmith shop remained open into the late 19th century. The blacksmith shop, eight buildings, two homes and a school are noted on town maps as late as 1872. A June 1892 flood swept away the town, leaving no trace of Millville in its wake, after a nearby dam burst. The pond waters tore down Clear Creek and poured into the South Fork Apple River, rushing toward Millville. The only historical marker paying homage to the Frink & Walker stagecoach company is inside Apple River Canyon State Park next to a marker commemorating the place where Millville once stood. Scales Mound (elevation 950 feet) is located at the base of a glacial erosional remnant similar to the privately owned Charles Mound (the actual highest point in Illinois at 1,235 feet) just one mile northeast of the village, about a mile southwest of Charles Mound. In 1830, Samuel Scales purchased the original village site from John Sole and built both a tavern and inn on the Stagecoach Trail and fought in the Black Hawk War. Scales Mound’s fitting motto is, “At the Top of Illinois.” More than 90 percent of The Village of Scales Mound is on the National Register of Historic Places. Charles Mound is open to the public on select weekends of the summer. Arriving at the southeast corner of Galena marks the end of the stagecoach trail. The trail ends near the 1854 John Westwick Foundry, which is still operational today. Ironically, 1854 is the same year the railroad came through and the old stagecoach line began fading away. As the Stagecoach Trail enters Galena, it rapidly transitions into Field, Claude and Meeker streets. Meeker becomes High Street if taken past Main Street. Galena would have looked much different to stagecoach travelers of the early 1800s. Back then, the town was largely built of frame construction. Similar to Nora, a series of problematic fires in the 1850s prompted a new city ordinance requiring all new construction to be made of brick or stone. Martin Thomas was appointed by the government in 1824 to oversee mine leasing and was commissioned to survey the mines in 1826. That’s when the name “Galena” was agreed upon during a town meeting. Galena is the type of lead ore that was mined there. At one point in time, Galena was the largest river steamboat port between St. Louis and St. Paul. But the need for Galena lead declined and the Galena River silted in and became unnavigable to steamboats. Siltation was a problem for many rivers stripped of their forested shores as wood was cut down to power steamboats. Railroad lines bypassed Galena, taking revenue with them and relegating Galena to backwater town status. New construction abruptly stopped, leaving the mid-1800s architecture to stand still like a snapshot in time. It’s part of what makes the town so charming for visitors today. Safe journey and happy trails! This entry was posted on Friday, November 3rd, 2017 at 11:58 am	and is filed under Features, Top Posts. You can follow any responses to this entry through the RSS 2.0 feed. Both comments and pings are currently closed.